Guy Mowbray unearths memorable games from the FA Cup's sixth round, including Watford v Arsenal in 1987 and West Bromwich Albion v Nottingham Forest in 1978. Guy Mowbray digs deep into the TV archives to unearth some classic games from the FA Cup sixth round. This programme includes Wycombe Wanderers' trip to Leicester in 2001, where the injury-hit Chairboys fielded a striker named Roy Essandoh - signed after an appeal for players who were not cup-tied on the BBC's Ceefax service. 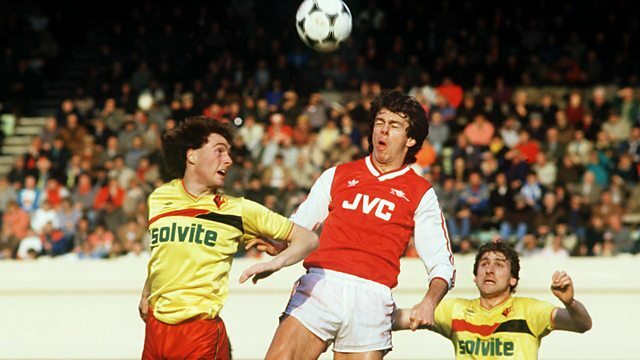 Also featured is Watford's trip to Arsenal in 1987 - the first season of George Graham's tenure as Gunners boss. The Arsenal team featured a young Tony Adams and David Rocastle, while the talents of John Barnes and Luther Blissett were among those on display for Graham Taylor's Watford side. West Bromwich Albion's meeting with eventual league champions Nottingham Forest in the 1978 season is also relived.